One of the big issues that we have as a group of two, running technical support for schools across Kenya is managing to find a way that we can help everyone while not actually being there. Ok, so we haven't really had this problem too much yet, but I can only imagine how bad it will get. To fix this problem we've decided that one of the best options is to teach the school how to install; that way if there's a major problem they can just wipe the computers and start over. 2) we have to use a distro that is very easy to install and set up. We've decided that Linux Mint is the best option. 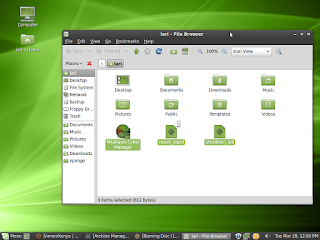 Both Linux Mint 9 and 10 look very similar to Windows, and have a simple interface. So then we just need to teach them how to install basic software after they do the installation from disk, which didn't turn out to be that bad. Most of our communication is done on-line so that makes it easier also. This means that the major issues that we might have are with the software that's supposed to save them bandwidth (apt-cacher-ng, and squid) as those are the two complex networking softwares that would be hardest to fix. So far we haven't heard of many examples where schools have had problems with them. On the other hand of it, another technical guy from the area and I are working together to figure out how we can prepare for the year I won't be here. This involves teaching him quite a bit of linux, since his background is in Windows. I've found a few resources, nothing amazing, but stuff that might be helpful if someone else was trying to pick it up. For the most part a combination of the Ubuntu manual and the Linux Mint manual have helped, though I'm still hoping to find a good, online, resource for learning Bash and general command prompt commands.